The Titche-Goettinger building in Dallas. Photo courtesy of 1900elmstreet.com. Although it’s easy to forget, it wasn’t always trendy to live downtown. That’s obviously no longer the case. The newfound popularity of downtown living combined with a limited number of condos for sale is probably why conversions are common in dense urban cores like downtown Dallas — apartments built from warehouses, office buildings, or industrial space. One of the best examples of a downtown building repurposed for modern living is the Titche-Goettinger Building at 1900 Elm St., a former department store transformed into rental lofts and now the UNT Dallas College of Law. The building, designed with a Renaissance Revival and Art Deco style by noted architect George Dahl, was built in 1929 as the headquarters for the local Titche-Goettinger department store chain. The concept of a department store is outdated enough by now that we’re probably impressed by a two-story Macy’s, but in the early half of the century, the department store was Amazon under one roof: Five floors of merchandise, with offices on the sixth floor and a 600-seat ballroom on the seventh. 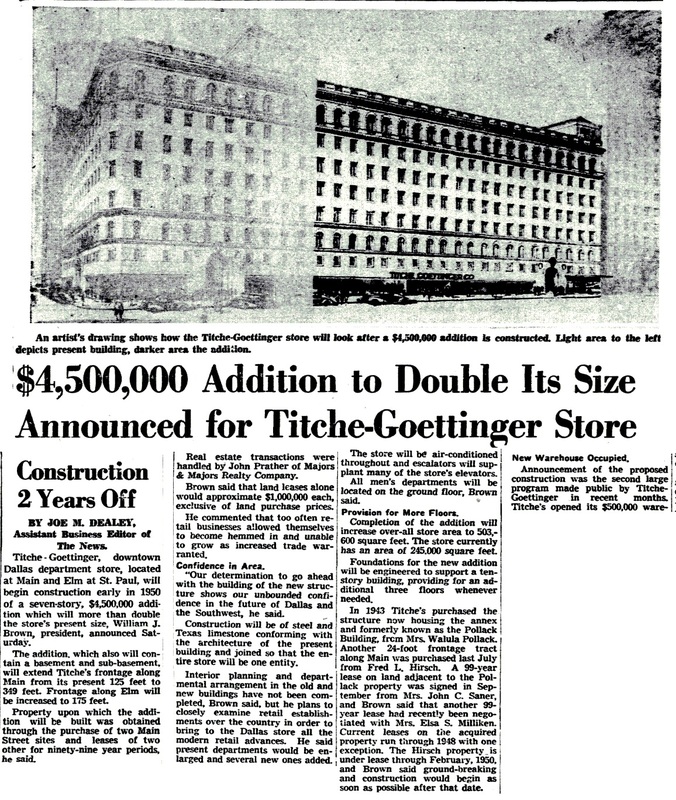 The Titche-Goettinger department store, prior to its 1955 expansion. Courtesy of the Dallas Public Library. But that wasn’t big enough — in 1955, an expansion was added that more than doubled the building’s size to more than 500,000 square feet. The store, then known as Joske’s, fell upon hard times in the late 1980s, and after a purchase by Dillard’s in 1987, closed to the public. In 1997, Oglesby Greene Architects chose the building at 1900 Elm for a residential conversion project — one of the first in downtown Dallas. The former department store turned out to be a perfect candidate for loft apartments, with high ceilings, original finishing work, and even some of the building’s old windows. One of the converted loft apartments at 1900 Elm. The ornamentation visible at the top of the column is preserved from the space’s department store days. Photo courtesy of 1900elmstreet.com. The building also housed the Universities Center at Dallas, a downtown higher education campus with four floors of classrooms available for students through the University of North Texas, University of Texas at Arlington, and Texas A&M University-Commerce. The University of North Texas now owns the entire building, including its loft apartments, and opened the new UNT Dallas School of Law in the building’s classroom space, where it will remain until renovations on the adjacent Dallas Municipal Building are complete. The UNT Dallas College of Law currently occupies part of the 1955 expansion of the building. The apartment conversions are located on the left side of this image. Photo courtesy of the Beck Group. Restaurant and retail space are also available on the building’s ground floor, but despite rumors to the contrary, nothing has materialized at present — which seems like a golden opportunity for some enterprising developer to sell sandwiches to UNT law students, doesn’t it?